Graduate of the Department of Public Relations at the Faculty of Mass Communications, Philology and Political Science of Altai State University Mikhail Melamed became a sports commentator at Channel One Russia, where he does telecast of 2018 FIFA World Cup. On Friday, June 22, Mikhail first commented out the match on federal television. The broadcast of the Serbia – Switzerland match, which Mikhail held together with Kirill Dementyev, was shown by Channel One. However, this was not the first time when ASU graduate worked as a commentator. Before that, he commented out the games of 2018 World Cup on the official website of the TV channel. He has already taken part in telecasting of several matches: France – Australia, Serbia – Costa Rica, Portugal – Morocco, Peru – Denmark and others. 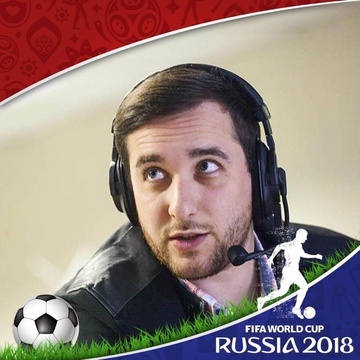 "I have very good partners for commenting on the matches: Pavel Zanozin , Alexander Kuzmak , Kirill Dementyev, Alexander Grishi n. They are very comfortable and us eful to work with, because I'm still gaining experience, and this is a real commentator school," Mikhail Melamed shared his impressions. According to Mikhail, it would be impossible to achieve the success without the participation in “I am a Commentator” competition, which was carried out by Channel One. He captured silver there and was invited to comment our broadcasting of football match Russia – Spain together with Victor Gusev. “The skills and techniques I managed to achieve while studying at Altai State University still help me at my work. Participation in KVN (Club of the Funny and Inventive People) also played a big role, as it taught me to improvise, manage voice and intonation, joke, and be liberated. In brief, I would like to express my gratitude to Altai State University for being the place, where I have found myself. The university continues helping its students even after graduation!” Mikhail noted. “FIFA World Cup is an unforgettable and inimitable event! Moscow is now vivid and full of colorful symbols and flags of the world’s countries. There are smiling faces everywhere. People embrace each other, sing, and take photographs. The holiday atmosphere is everywhere. Of course, I have to prepare for each match, which takes quite a while, but this is an interesting work of great responsibility that I could not even dream about. But dreams come true, you should believe in it, constantly cultivate your abilities and improve yourself,” Mikhail summarized.